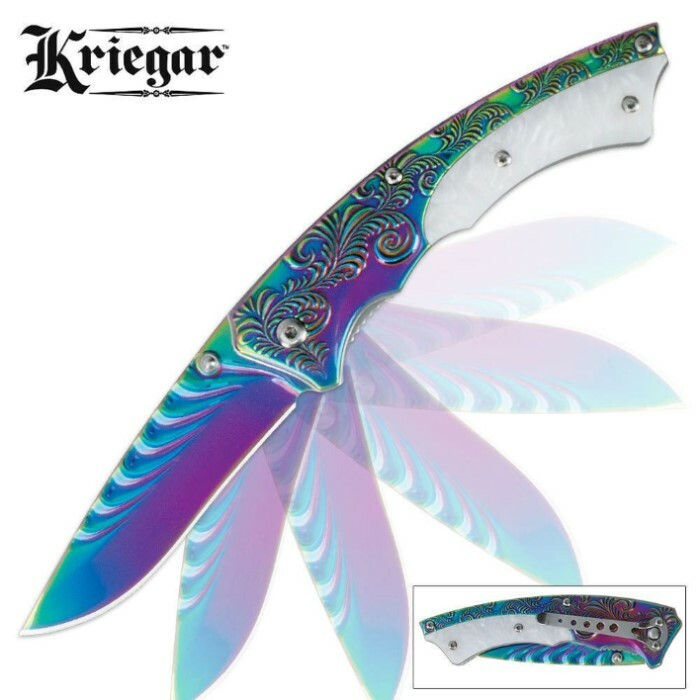 Kriegar Rainbow Titanium Assisted Open Pocket Knife | BUDK.com - Knives & Swords At The Lowest Prices! This Kriegar Rainbow Titanium folding pocket knife will soon be your favorite! This knife offers a rainbow titanium-coated stainless steel blade and handle scales with an elegant scroll design. The blade has a rippled appearance for added appeal, and the handle also features an imitation white shell insert. Opening quickly and effortlessly with assisted-open technology, this knife is a beautiful package all the way around and definitely upholds the quality German standards of Kriegar. This knife is gorgeous. Lightning fast. Razor sharp. Awesome. Got mine on sale. I've received a lot of compliments for this knife from both men and women. Thanks BudK! You guys are the best. This is a beautiful knife, my wife swooped up the second one real quick. It is now my EDC because it does outperform a lot of other folders I own and it looks great. I love when someone asks "Do you have a knife I can use for a sec" and I snap this baby out and hand it to them. Guess I'm more than just happy with the purchase I'm proud to own this "cheap" knife. This beautiful knife has spent a month in my pocket. The color hasn't rubbed off a bit. All the screws are still tight. The assisted opening that started off great is getting better and better everyday. The blade sharpened up really well and it's ridges are soothing to stroke. I love this inexpensive piece of pocket jewelry and would have paid twice the price for it. This knife looks gorgeous! It has a comfortable and solid feel. The blade snaps open swiftly and smoothly, and is very easy to close. Bought this as a starter knife for my oldest daughter. She absolutely loves it, and I'm impressed. For the price, it's a fantastic blade. Heavy enough to have some heft, but not too light. The assisted opening is fantastic. She's very happy with it, and I'm happy I picked it up for her. What a pleasant surprise! The smooth opening & closing of the blade is great. It would still be a great purchase at twice the price. This is the knife you want to show off when someone in the group says "does anyone have a knife"? Just recently got this knife and I must say....GORGEOUS!!! It is truly and beautiful knife. It shines brightly and most colorfully. The shell inlay handle gives it some class, and the scroll work and wave designs on the top of the blade give it some depth and personality making it all come together as a beautiful piece Comes pretty sharp out of the box. This is my first spring assisted knife and I'm glad I chose it to be my first. The spring assist is lightening fast and smooth, and the shape and grip of this knife makes it feel comfortable and sturdy in the hand. I recommend this knife for any collector and enthusiast. For the price you can't go wrong. What a "Beautiful", & well made knife for the low price!! I was also surprised that the "curves" on the blade itself were actually raised above the blade & not just painted that way. The "Mother of Pearl" on the handle adds to the already beauty of this knife.....an excellent display knife!!!!! A very well-made knife, very sharp. The handle onlays appear to be steel. The assisted opening feature is almost unnecessary, this is a display only knife. Cool looking at a good price.